We are used to seeing landscape photos of sunrises and sunsets over mountains, and bodies of water. I’ll admit to being a little envious of those folks who live near the mountains or coastlines, or can at least travel to them on a regular basis. Living most of my life out on the prairie farmlands of Minnesota and even now being on the edge of the farmlands, I tend to feel that if you were to make a living as a landscape photographer you’d want to live near the mountains or large body of water so you could increase your chances of catching the “right” light. Sometimes though, the prairie landscaper gets lucky. An old country road with some ice becomes the interesting foreground and your eye rides it to the psychedelic sky. It’s nothing like something you’d see out west in one of the national parks, but rural folks are used to making due. 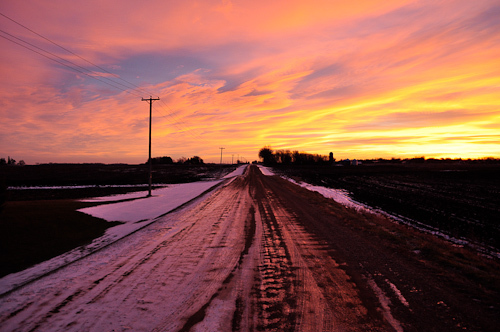 This entry was posted in Uncategorized and tagged country road, golden hour, pink sky, rural, sunrise. Bookmark the permalink. This sunrise photo is absolutely spectacular, Ryan. I love prairie sunrises, always have. Living in town now, in a valley, that is what I most miss, a clear view of the sunrise and the sunset. Every time I’m in southwestern Minnesota, I make sure I get a good view of the sunset. I know what you mean by missing a clear view. I drove charter bus in college and for a short bit after. I spent some time in Colorado and while beautiful, I started to feel a little closed in on and missed being able to see the horizon. Exactly. Put me in a geographical location with lots of trees and I start to feel closed-in. I, too, need to see the horizon. Once a prairie dweller, always a prairie dweller at heart.